Discussion in 'Transformers News and Rumors' started by chinaseller, Apr 29, 2009.
here i have a boat,but i don't know how to transfor it to be a robot,so hard. Tell ya what, send it to me and I'll take pictures of the robot mode for ya. Nah dude, send it to me. The guy below me can't be trusted. i'm thoroughly confused. why is this in news and rumors? Least he showed us the head! Maybe 'cuz it's new pictures of a Botcon toy? 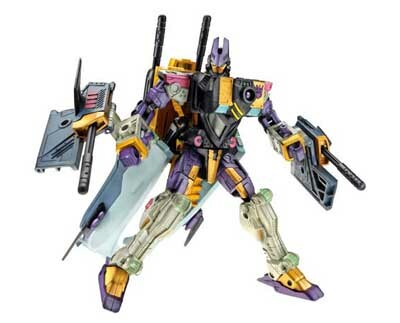 What repaint of Energon Mirage is this? I can't say I've seen it before. Hey, it's Banzai-tron... neat! The instructions on how to transform it are online here if you scroll down. It's supposedly for Botcon '09. This is a Botcon toy. We saw the alt mode a while back... But these are new pictures, and at least now we know that the toy doesn't have a new head. Unless this is a test-shot using the old head like that Flak we saw last week. This also answers the questions about the writing on the side of his alt mode... It's not Japanese. It's gibberish. I really want this, wish I had the funds right now! At least he isn't posting just to pawn it off this time. The colors are looking, not sure I like that head though. from those cyberglyphs down the sides, is this a movie redeco then? The head looks the same but slightly different. Is it a new head?